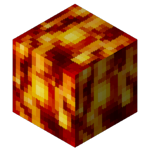 Lava is a non-renewable liquid block that emits light and sets surrounding blocks on fire if they are flammable. It harms the player by four hearts ( ) every second while touching it, and causes drowning damage of half of a heart ( ) while submerged in it. Lava also has a high viscosity, meaning the player can only move very slowly while in it. In minetest players can swim in lava, in comparison to real lava. Falling into lava is often a death sentence, so be careful! Players can place lava by using a lava bucket, which can’t be stacked, or with a Lava Source if playing in Creative Mode. On a flat surface, it can flow up to a distance of eight blocks. Lava can be “cooled” into obsidian or stone by various lava-cooling blocks: If water, river water, ice or snow block is touching a lava source (even diagonally or at a corner), the lava source changes into obsidian. Flowing lava changes into stone instead. Every 10 seconds, flammable items inside lava are destroyed. Lava usually appears in lava lakes of varying size deep in the underground. By default, lava appears at the height Y=-256 and below for all map generators except v6. The lava height for these can be changed in the settings. In v6, the lava height is fixed at Y=-32 or lower. Lava first appeared in version 0.2.20110922. This page was last modified on 11 March 2019, at 08:12.